Back in February of 2016, I published an Instructable on 9 Unusual Tool Storage Methods for Your Workshop, which is now one of my most viewed Instructables, with over 100,000 views! Since I can't stand messy workshops, and got so much positive feedback in part 1, In this Instructable, I'll show part 2, with 9 more unusual ways to store your workshop tools! *Pssst! Don't forget to check out more info about the (weird...) giveaway in the comments! I think this one is my favorite tool holder. It looks like it floats, but is actually really strong, and saves me A TON of space! For my pliers, I drilled a hole into my pegboard, and then epoxied in bent rod. This can hold a lot of pliers, wire cutters, and several more... For my tweezers, I drilled a hole into my pegboard again, and then glued a dowel, which I had previously CA glued a metal rod in the middle. Other than the fact that it's a bit too short, it works really well, and I think it should last me a long time. To make this you'll need a drill and drill bit, a steel rod, a torch for bending it,and some epoxy. Step 2: Drill Storage - a Hole in My Workbench! Drill a hole in your workbench? Yes! A really simple method for storing your drill is to drill a hole in your workbench, and mount your drill's bit inside the hole. This way you can return it quickly, and return it when you're done drilling. I have quite a bit of ~1mm rods, which I have salvaged from CD/DVD Rom's. These are extremely useful for storing all sorts of tools such as Hand-Planes, hammers, and mallets. I also use a bigger rod for storing all four of my spring clamps. Step 4: Container Tool Storage! For almost a year, I've been Storing my small screwdrivers with a strip of magnets to the wall. It worked really well, except for the fact that the magnets weren't strong enough. Bonus: Can you guess where this plastic container came from? Step 5: World's Biggest Box Joints! This method works really well for storing mallets and hammers, but it can also work well for storing clamps, and other similar tools. Step 7: Metal Book Dividers for Shelves - Hand-Plane Holders! While I did show this method in part one, I thought I would put it in this Instructable too, since I think that is is either the best, or the second best option. I use square screw hooks to hold many of my tools, such as hammers, my anvil, my speed square, my bar-clamps, and many more. If you haven't seen part one, make sure to see 9 Unusual Tool Storage Methods for Your Workshop (Part 1)! I read and reply to ALL comments, so make sure to leave your suggestions, upgrades and improvements, and any other ideas in the comments below! 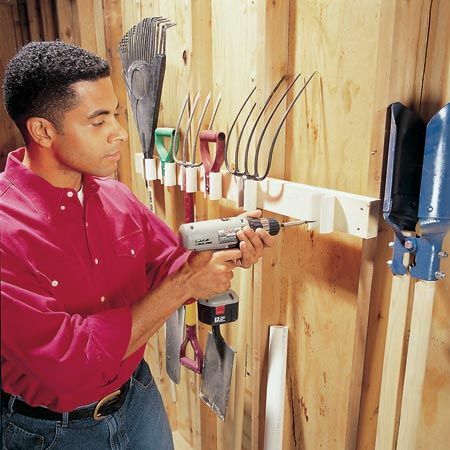 I'm challenging YOU to think of a tool that you don't know how to store (store efficiently, hang on a wall/pegboard, etc...). How am I supposed to help you with that? Also, what did you want to collaborate on? It can compress, but 5 sheets takes a lot of force, and i do not have a vacuum pump nor air-tight container. Those are some awesome storage ideas, and i think i will combine several of those ideas to make the most out of my little shed space! Thank you very much! I can never seem to find a way to store my jigsaw and circular saws (don't have cases) effectivly w/o taking up unnesicary space. I hav a 5ft long scythe - its yusefull for clearing gardens and a pane in the backside to stor! I also have a scythe and on the outside of my garage on a ledger board ( a 2" x 10" x 12 foot attached to the studs of garage, under the protected eves, I have attached various sizes of pvc/abs pipe (depending on the tool it is to hold) of various lengths. My scythe is one of those tools along with shovels, picks, rakes stc. They are all outside tools stored where they are usually used. I'm confused. Can you send me a picture of where you want to store it? How big is the microscope? How much does it weigh? What shape is it?How often do you use it? Where in your workshop can you store it? Never heard of those, is that a tool? From what I see in Google images, I think this can be stored with Square screw hooks. One on each (segmented?) top part. I'm not sure how big they are, but step 4 might work too.